Seifuku Nitta Hanshi promoting Frank Williams Kaicho to 9th Dan in Shorin Ryu Karate, Okinawa, Japan. Mr. Williams was born in Concord, North Carolina in May 1959. He graduated from Concord High School in 1977 and went on the earn his Bachelor of Arts in Business Management from the University of Maryland. He subsequently earned a Master of Science in Education from Troy State University. He began his martial arts training in 1971 and received his Black Belt in Tae Kwon Do in 1973. In 1982 he was stationed in Okinawa, Japan as a young Marine and began his journey in Shorin Ryu. He lived and trained in Okinawa for 13 of the last 30 years under the tutelage of Grand Master Fusei Kise of Shorin Ryu Kenshinkan, Kyoshi Ed Gingras and Akamine Yoshimatsu of Matsumura Seito Shorin Ryu and Hanshi Seifuku Nitta in Shorin Ryu. ​In 1999 he was granted permission from Grand Master Kise to begin the "Zen Sekai Bujitsu Kyokai" or Universal Martial Arts Association. He has served as the President and Founder since its inception. Today his organization has members in over 29 States of the United States and 30 countries around the world. He continues his training by traveling to Okinawa every 6-12 months and by sponsoring Okinawan teachers to come to the USA and teach at member schools and special events such as the UMAA Summer World Training Camp and the Hall of Fame. He strives to make the UMAA a special group of friends that enjoy training, sharing and learning with each other. In this association "the similarities of our styles and concepts are important not the differences". Sensei Williams served as the United States Director for the Okinawa Kensei Do-Ko Kai headed by Hanshi Seifuku Nitta and overseen by Hanshi Seiki Toma in Okinawa, Japan until Toma Sensei's death in October 2007 and later Nitta Sensei's death in 2012. Mr. Williams received his Menkyo Kaiden from Hanshi Seifuku Nitta in 2007. 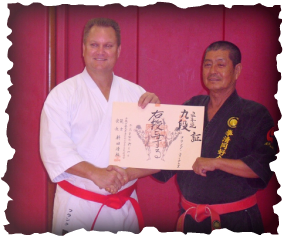 Mr. Williams was promoted to 9th Dan (Hanshi, Kudan) in Okinawa Kobujutsu in November 2016 by Nakamoto Kiichi of the Okinawa Kan while in Okinawa. He is also the Owner/Operator of very successful martial arts school Havelock, NC where his black belts currently teach over 200 students. His legacy of Shorin Ryu is carried on by his son, Ryuji, as the Chief Instructor (Kancho) at the school he founded nearly 20 years ago in Havelock, NC. Mr. Williams retired from the United States Marine Corps in September 2005. He is a retired USMC Chief Warrant Officer-4 and served as a Hand to Hand Combat Instructor, Close Combat Instructor Trainer and Marine Corps Martial Arts Black Belt Instructor while on active duty. Currently he teaches seminars all over the world and mentors martial artists on subjects such as martial arts business, karate history, applications of kata, kobudo and tuite. 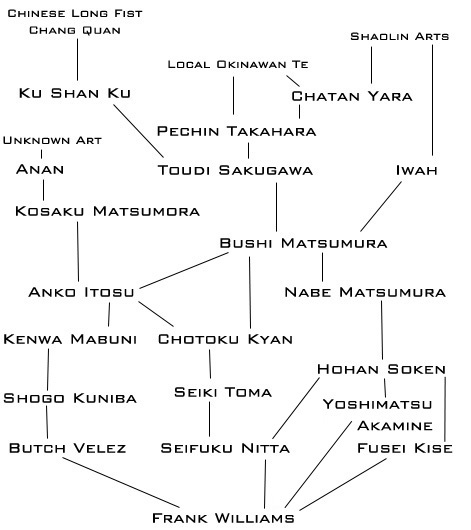 ​Below is a list of some of his martial arts rankings and accomplishments. Kudan (9th Degree Black Belt)- November 2016 - Okinawa Kobujutsu - Nakamoto Kiichi. Kudan (9th Degree Black Belt)- June 2015 - Shorin Ryu - Nitta Seifuku. Menkyo Kaiden - 20 September 2009 - Shorin Ryu - Hanshi Seifuku Nitta. Hachidan (8th Degree Black Belt) - September 2007 - Shorin Ryu & May 2011 - Okinawa Kobudo. Kyoshi Title awarded 1 January 2007 in Shorin Ryu Karate and Kobudo. Shihan Title and Certificate awarded 17 July 2004 Matsumura Shorin Ryu.